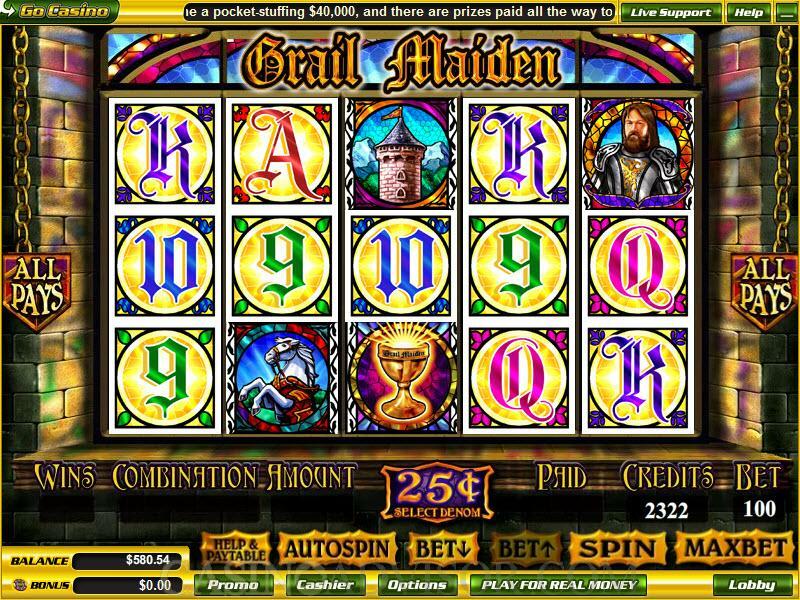 Grail Maiden is an unusual slot game in that it does not follow the usual paylines concept. The specified number of symbols in any position on the reels from left to right starting from the left most reel forms a winning combination. This concept has been named as All Pays by Vegas Technology. Grail Maiden has the medieval theme of knights. The slot begins with a video clip with martial music that highlights the features of the game and introduces the symbols. The Maiden, the Knight, the Horse and the Castle recreate the medieval atmosphere. The high value card symbols from Nine to Ace are suitably crafted in ornate fonts and set against gold backgrounds. The wild symbol is the Grail and the scatter symbol is the Grail Maiden Logo. The background music played as the reels spin is foot tapping and blends with the theme. The Grail Maiden online slot does not have any fancy animations. The symbols in winning combination light up. Because of the All Pays feature the betting options for Grail Maiden online slot are slightly different. The concept of line bet has no meaning. The minimum wager is 25 coins per spin. The payout table gives the payout in coins for the various winning combinations for this minimum wager. Wagers can be placed in multiples of the minimum wager up to 4x. If players wager 2x the minimum wager, that is 50 coins, the payout will be double of that shown in the table. Players can use the Max Bet button to wager 100 coins. Four coin sizes are available. These are 0.01, 0.05, 0.25 and 1.00. The Grail is the wild symbol. It appears only on reels 2, 3 and 4. The Grail Bonus Feature is triggered when the Knight appears anywhere on reel 1, the Maiden appears anywhere on reel 5 and the Grail appears anywhere on reels 2, 3 or 4. The Grail Bonus Feature is also triggered when Knight appears anywhere on reel 5, the Maiden appears anywhere on reel 1 and the Grail appears anywhere on reels 2, 3 or 4. 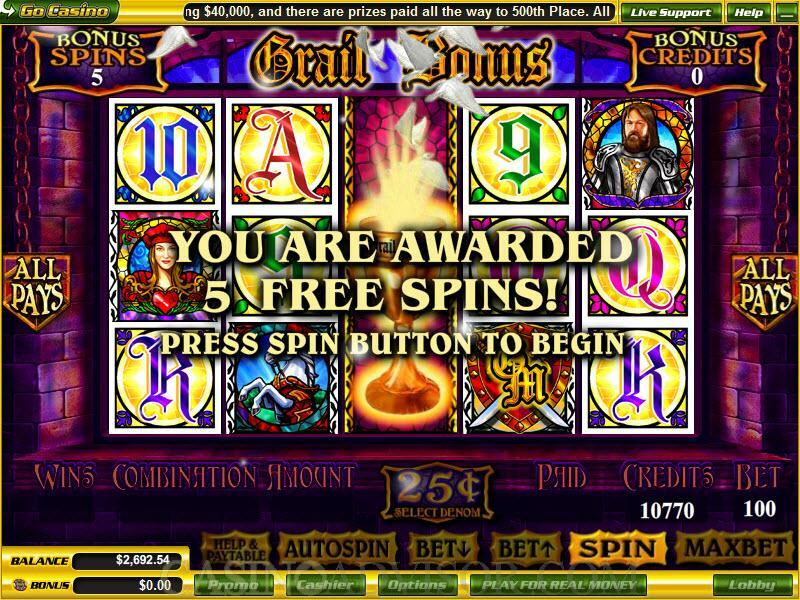 In this feature the player gets 5 free spins. The Grail expands to cover all the rows on the reels on which it had appeared and remains fixed on that reel for all five spins. The Grail Bonus Feature can be retriggered if the Knight and Maiden appear as described earlier and the Grail appears on a non held reel. The new Grails then expand on that reel, which is held fixed for the remaining free games. The Grail symbol does not multiply payouts nor does it offer any line payouts. The Grail Maiden Logo is the scatter symbol. When three or more Grail Maiden Logo symbols appear anywhere on the reels scatter payouts result. 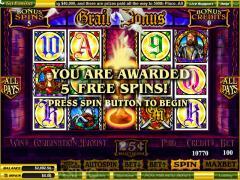 The Grail Maiden online slot game does not offer any bonus game on the second screen. Interested in reading more detailed information about Grail Maiden? If so Click Here for more details.